Approximately 50% of the benefits are due to the push to central clearing. 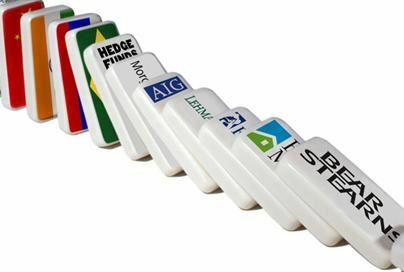 The bilateral structure of much of the OTC derivative markets multiplies the amount of credit risk in the system, leaving it more fragile. With well structured central clearing, many offsetting exposures are cancelled and the total amount of credit risk in the system is reduced, making it more stable. According to an earlier BIS report, moving $1 of derivatives from a bilateral system onto central clearing can reduce the exposure in the system associated with that derivative by approximately 75%. The report is calibrated to year-end 2012 when the notional amount of OTC derivatives outstanding stood at $480 trillion. Of this, approximately 60% or $288 trillion was held bilaterally and 40% or $192 trillion was cleared. Taking 1.10% as a rough figure for the average exposure per $1 notional produced in a bilateral system, the total exposure produced by the bilaterally held derivatives is $3.168 billion. Since clearing is approximately 4 times as effective in reducing exposures, the average exposure per $1 notional in a cleared system is 0.30%, so that the total exposure produced by the cleared derivatives is $0.576 billion. The total exposure in the system from the $480 trillion in OTC derivatives is $3.744 billion. The report’s central scenario is that the reform’s clearing mandate results in a shift of 20% or $92 trillion notional of total OTC derivatives into clearinghouses. This reverses the 60/40 market share. Because more derivatives are cleared, and because clearing results in a smaller net exposure, total exposure in the system drops to $2.976 billion—a reduction of $0.768 billion or 21%. The BIS report then takes its calculated reduction in exposures, and determines how this impacts the likelihood of a financial crisis. With a lower total exposure from derivatives, the financial system is more resilient to shocks, and less likely to fall into crisis. And since financial crises are very costly, avoiding crises is very beneficial. In addition to evaluating the impact of the clearing mandate, the BIS report also evaluates the reform’s increased collateralization of derivative trades. Clearing entails margining trades, but even non-cleared trades between financial institutions must now be margined. The other 50% of the report’s calculated benefits are due to this increased collateralization of the system. The BIS report also makes an estimate of the costs associated with this increased collateralization. It pegs it at approximately 0.4% of annual GDP, so that the net benefit of the two elements of reform—decreased exposures from clearing, and increased collateralization—is 0.12% of annual GDP. The BIS report’s headline figures are just one possible value for the actual benefits and costs, both of which are highly uncertain and dependent upon many factors. 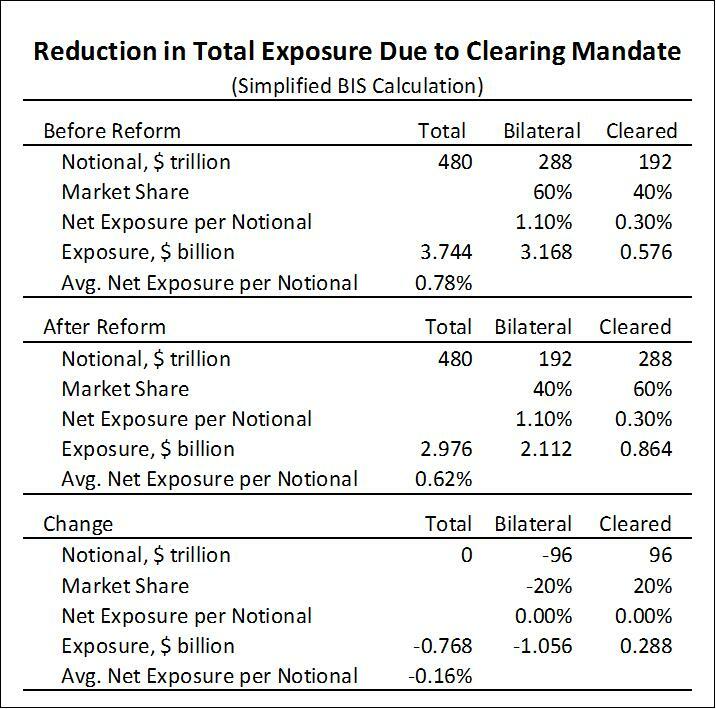 For example, the actual extent to which the clearing mandate reduces exposures depends upon how it is implemented. If trade is fragmented across many clearinghouses, then the potential benefit may be greatly reduced or even undermined altogether. Similarly, the impact of the clearing mandate depends upon how firmly regulatory authorities push. The BIS report’s central scenario assumes a conservative push. And the impact of collateralization depends upon the fuller context in which the derivative reform takes place. This includes bank capital requirements and how effectively regulatory authorities constrain the amount of risk elsewhere in the financial system. BIS, Macroeconomic impact assessment of OTC derivatives regulatory reform, August 2013, by the Macroeconomic Assessment Group on Derivatives, established by the OTC Derivatives Coordination Group. The main simplification in this table is the use of a fixed value for net exposure per $1 notional for all derivatives held bilaterally, both before and after the reform, and another fixed value for all cleared derivatives. The BIS report models the exposure for different classes of derivatives—interest rates, credit, foreign exchange, equity and commodities—and makes different estimates for how much of each class is moved to central clearing. This entry was written by John Parsons, posted on September 2, 2013 at 8:33 am, filed under credit risk, Dodd-Frank, exposure, markets, OTC reform, regulation, systemic risk. Bookmark the permalink. Follow any comments here with the RSS feed for this post. Post a comment or leave a trackback: Trackback URL.